Companies all across the country are looking for new ways to reduce overhead and increase profits. One way to lower your monthly bills and help your business to be more energy-efficient at the same time is to make the switch to commercial heating oil in Fall River. Compared to other methods of providing heat for large office buildings, industrial shops, warehouses, shopping malls and other types of facilities, commercial heating oil is more cost-effective and clean-burning, and offers other advantages as well. While other types of fuel sources have been up and down like a roller coaster over the past ten years, commercial heating oil has stayed the most consistent. Compared to electric, propane and even natural gas, more businesses are now relying on Fall River commercial services for commercial heating oil than ever before. Choosing to work with a reputable company that is reliable and dependable is extremely important. Guard Oil provides quality services in the Greater Fall River area, even providing additional deliveries of motor oil for industrial use and hydraulic oil for industry manufacturing and equipment. It can be difficult to budget for utility costs and other types of overhead if the cost for your energy source is constantly changing. Commercial heating oil in Fall River is dependable and fair, providing cost-effective heating for consumers, manufacturing, warehousing and many other industries. Local and competitive national pricing helps to protect both the supplier and the consumer, as well as the supplier’s ability to store fuel in bulk, passing the savings on down to clients when needed. Another huge advantage to choosing commercial heating oil in Fall River over other options is that heating oil burns at a higher temperature than propane, allowing it to heat larger, more open spaces like commercial properties even faster than other type of fuel. The concentrated heat that comes from heating oil purchased through Fall River commercial services is more consistent and even, helping every room, office and area of your property to be more comfortable. This efficiency can also help to save money on your annual utility bill, saving hundreds each year on heating costs. Switching from a natural gas or propane unit can help you to lower energy costs and provide more consistent heat. Many of the modern units for sale on the market today are much more effective at providing instant heat and better thermal management than units that are just ten years old or more. 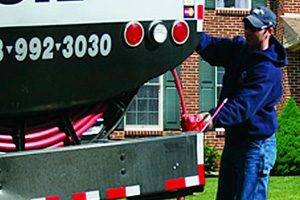 Guard Oil offers automatic delivery of commercial heating oil in Fall River, along with our other delivery services to commercial clients, including hydraulic oil for industry and motor oil for industrial use. You won’t need to schedule employees to manage your heating system, but can contract with our team instead to automatically deliver fuel as-needed, monitor your system, and provide regular repairs and maintenance. Your property’s usage will be charted by our team and any future deliveries will be scheduled automatically to prevent your business from running out of fuel when it needs it the most. Today’s modern furnaces that use Fall River commercial services for heating oil are clean-burning and do not put off any residue. Compared to propane or natural gas, commercial heating oil is much safer, as the tanks are fully secured to prevent leaks. However, should a leak occur for any reason, any heating oil that spills or leak is non-toxic and does not pose a hazard to people, pets or air quality in the immediate area. Home heating oil is non-flammable and non-explosive, making it the smart choice for residential and commercial use. Contact Guard Oil by calling 508-992-3030 and speak with one of our friendly and knowledgeable team members. We can provide you with a no obligation quote for any of our Greater Fall River commercial services. Call today and learn for yourself why so many of your neighbors in Southeastern Massachusetts and Rhode Island count on Guard Oil in Fairhaven, Massachusetts for all of their commercial heating oil, motor oil and hydraulic oil for industry needs.